Wilayat Sinai claimed five attacks in North Sinai in connection with the Islamic State’s “Revenge of al-Sham” campaign. On April 7, two policemen were reportedly killed and two others injured in an unclaimed attack in which gunmen fired on a security patrol in New Nozha, a neighborhood northeast of downtown Cairo. Another unclaimed operation was reported on April 12 in which militants attacked a checkpoint in the Suez governorate. Egypt announced that is pulling out of the U.S.-led Middle East Strategic Alliance (MESA). Egypt’s interior ministry conducted two counter-terrorism operations, one in Qalyubia and one in Arish. On April 6, the Giza Criminal Court referred seven of 26 defendants to the grand mufti for the death penalty after convicting them of attacking a hotel in Haram Street in Giza in 2016. 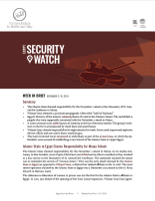 On April 9, Wilayat Sinai claimed responsibility for a suicide attack targeting an Egyptian police foot patrol in Sheikh Zuweid’s Tuesday market. Wilayat Sinai claimed the attack killed or injured 15, including the lead police investigator in Sheikh Zuweid. The interior ministry said the bomber was about 15 years old—though a martyrdom video from Wilayat Sinai draws this claim into question—and reported that four policemen and three civilians were killed and 26 civilians were injured. That same day, Wilayat Sinai claimed responsibility for three additional attacks: an improvised explosive device (IED) attack near the Abu Shanar checkpoint in Rafah, an IED attack targeting an Egyptian M60 tank near Arish, and a sniper attack which killed an Egyptian soldier at the al-Masoura checkpoint on the Rafah-Arish road. On April 10, Wilayat Sinai claimed responsibility for an ambush west of Arish, which it claimed killed or injured seven. According to the claim, the group used several IEDs, rocket-propelled grenades (RPGs), and small and medium weapons” to target a military convoy on the International Coastal Road. The group later published photographs depicting the munitions seized from the convoy. Mada Masr reported that the attack killed four—an officer, a conscript, and two civilians—and wounded three. The uptick in violence coincides with the Islamic State’s “Revenge of al-Sham” campaign. Amaq, the Islamic State’s media arm, has begun to open attack claims with “As part of the revenge campaign for the blessed state of al-Sham,” before the normal description of the operation. (Al-Sham is an Arabic name for the Levant region.) This opening has also been included for operations spanning Islamic State affiliates in Syria, Iraq, Niger, Libya, and Somalia. The April 9 suicide attack in Sheikh Zuweid, which killed three civilians and wounded 27 more, marked a noticeable departure from Wilayat Sinai’s practice of targeting security personnel and Christians and may be attributed to influence from the Islamic State’s central command. On April 7, a police vehicle came under fire in New Nozha, a Cairo suburb. Unidentified gunmen killed two policemen and wounded two others. The attack potentially represents the first terrorist operation in greater Cairo since a December 2018 attack on a tour bus in Giza, which killed four. On April 12, a Twitter source reported that militants attacked a checkpoint near Ayoun Moussa in the Suez governorate. Three militants, including a suicide bomber, were reportedly killed and three members of the security forces were reportedly wounded. No group has yet claimed responsibility for the operation. There has been no terrorist activity in the Suez governorate since January 2017, when explosives detonated at a transmission tower in Ayoun Moussa. Egypt did not send a delegation to a Middle East Strategic Alliance meeting held on April 7 in Riyadh, Saudi Arabia, and has reportedly withdrawn from the organization. Some reports suggest that Egypt withdrew because it had not seen a formal proposal and did not want to risk increasing tensions with Tehran. The project was announced in May 2017 and aimed to create an Arab equivalent to NATO. Remaining participants include the United States, Saudi Arabia, the United Arab Emirates, Kuwait, Bahrain, Qatar, Oman, and Jordan. On April 11, the Egyptian Ministry of Interior announced that it had killed 11 suspected terrorists in the Abu Eita area in Arish. The incident marks a slight break from the overall trend of the Ministry of Defense announcing counter-terrorism operations in Sinai. The defense ministry last announced such operations in March. Also on April 11, the interior ministry said that it conducted a preemptive raid on an alleged Hassm cell in Qalyubia, and killed six members of the group. On March 7, the interior ministry announced that it had killed seven alleged Hassm members in a clash on the Ring Road in Giza, and, on March 20, 11 alleged Hasm members were referred to the State Security Criminal Court for attempting to assassinate Chief of Alexandria Security Directorate Mustafa al-Nemr in March 2018. Hassm has claimed a single operation in 2019, a failed IED attack in Giza in which explosives prematurely detonated when the car transporting them collided with another car. On April 6, the Giza Criminal Court referred seven of the 26 defendants convicted in the January 2016 attack on a tour bus of approximately 40 Arab Israelis to Grand Mufti Shawky Allam for consideration for the death penalty. The attack was later claimed by Wilayat Sinai, which incorrectly said the incident resulted in deaths and injuries. Independent reporting determined that no one was killed or injured in the attack, in which militants targeted the tour bus and nearby security personnel with birdshot, flares, and molotov cocktails. In Egypt, ahead of final sentencing, the grand mufti issues a nonbinding recommendation on cases involving capital punishment.